The Lady Saints maintained their No. 1 position in the USCAA Div. II rankings with a couple of wins this week, while the men’s team moved up to sixth in the nation. 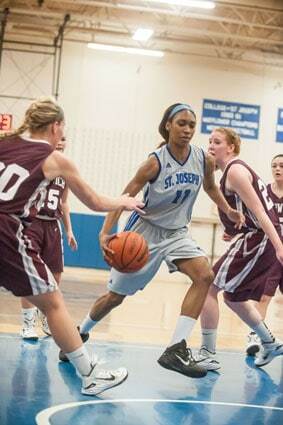 Regina Steele continues to be a force for the Lady Saints with her name appearing all over the USCAA Div. II leaderboards. She is first in blocked shots and field goal percentage, third in points, second in field goals, and second in rebounds. The Fighting Saints men’s basketball team defeated NHTI by a score of 93-79. Dre Anderson led College of St. Joseph in scoring with 30 points. Steven Edwards added 26 points and 3 steals in the contest. The Lady Saints basketball team also got a win against NHTI by a score of 69-59. Regina Steele led College of St. Joseph in scoring with 21 points. Chontayvia Kennedy added 15 points and 3 steals. The Lady Saints were on the road against Vaughn and were able to come away with a 96-46 win. Chontayvia Kennedy led the Saints with 21 points, 6 rebounds, and 5 steals. Imani Stephenson also was able to contribute 13 points and 6 rebounds. The game was tied at 15 early, but the Saints went on a 24-2 run and never looked back. The Lady Saints held Vaughn to just 25 percent shooting and was able to out-rebound them 61-39. The Fighting Saints men’s basketball team pulled a big win against NCAA Division III Pine Manor on their home court by a score of 105-88. Steven Edwards led the way for the Saints with 28 points, including going 13-14 from the line. Dre Anderson added 23 points. The Saints men traveled to Berkeley-NYC and dropped the game by a score of 79-66. Dre Anderson scored 19, while Kyle Houston added 13 in the effort. Berkeley was big on the boards with a 46-28 rebounding advantage. The Fighting Saints basketball teams each have a pair of home games this week. They play at 5:30 (women) and 7:30 p.m. (men) Feb. 4 against VTC and at 6 (women) and 8 p.m. (men) Feb. 5 against ACOPH. Admission is free at the CSJ Athletic Center.